The 31.7 metre motor yacht Sharon Ann, listed for sale by by Mark Elliott at IYC, has been sold with Todd Rittenhouse of Northrop & Johnson introducing the buyer. Built to ABS class by US yard Destiny and launched in 2002, she has been constantly and carefully maintained ever since, with a major refit in 2006 and further upgrades in 2015 and 2017. Styled inside and out by Evan K Marshall, she sleeps eight guests in a master suite, two double staterooms and a twin cabin. All staterooms come with en-suite bathroom facilities. A rare feature for a yacht of this size, her master stateroom stretches over two levels. Hi­gh-gloss Italian Radica walnut wood, accented with a cherry wood trim and soft beige carpets create a comfortable and elegant atmosphere in the main saloon, where up to 20 guests can be hosted with ease. 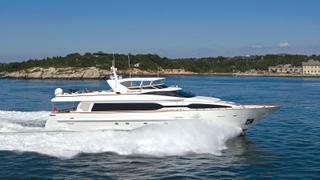 She has a large aft deck with a dinette seating up to ten guests for enjoyable alfresco dining with spectacular views. Moving to the upper deck and the covered flybridge has been fitted with another dinette, wet bar, Jacuzzi and sunloungers. This area can also be used to store a RIB tender and a pair of Jet Skis. Power comes from twin 2,986hp MTU 12V4000 M90 engines that give Sharon Ann a cruising speed of 21 knots, topping out at 26 knots. Lying in Fort Lauderdale, Sharon Ann was asking $2,400,000.